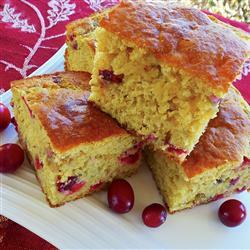 Sweet and tangy cranberries add flavor and color to this easy to make "corn bread"! Preheat oven to 325 degrees F. With coconut oil, grease the bottom and sides of an 8-inch baking dish. In medium bowl, sift together almond flour, coconut flour, sweetener, salt and baking powder. Set aside. In small bowl, whisk together the milk, butter and eggs. Pour milk mixture into flour mixture and stir just until softened. Pour into prepared baking dish and bake 18-20 minutes, or until done.